Thank God Muji introduced this summer their Beauty line. And though known for their minimalist interiors and organizers, Muji sees the skin much like they see a bare room, a chance to invite beauty in the simplest way. And if you have sensitive skin like I do, you’re in for a treat. Meet Muji Sensitive Skin Series brings us back to the basics of skin care. It makes caring for the skin simple especially for those dealing with sensitive skin such as redness or quick allergic reaction. Light toner provides deeper cleansing without stinging the skin. It feels like water, if you ask me. Moisturizing milk is lightweight and easily-absorbed to the skin. Major ingredients include Grapefruit Seed Extract and Portulaca Oleracea. Grapefruit Seed is an effective anti-oxidant and even acts a natural preservative to keep your products fresher for longer. Portulaca Oleracea contains vitamin A, C, E and co-enezyme Q10 which is great for hydrating the skin. More so, it’s a known natural remedy for melasma and psoriasis. But wait there’s more! Muji also added new products to their body care. There’s the new Body Milk, Body Scrub and Hand Cream in interesting and skin caring variants such as Shea Butter, Verbana and Breton Seaweed. 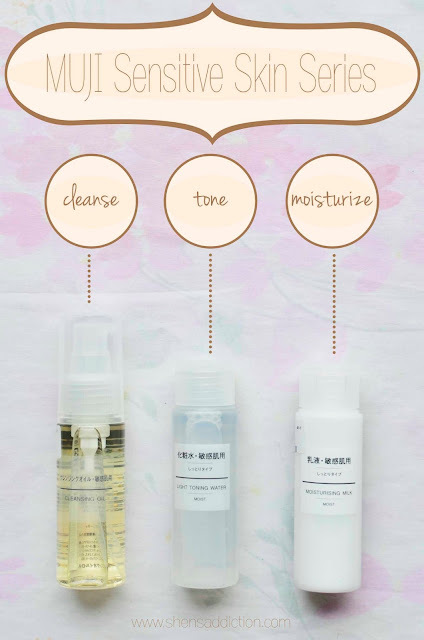 Here’s what MUJI has to say about their new stuff..
Breton Seaweed is a natural marine wonder with anti-ageing agents that also revitalizes and moisturizes the skin. It leaves the skin fresh and glowing due to the phytonutrients that stimulates proper blood flow. Shea Butter is a popular skincare ingredient that encourages the skin’s collagen production to restore its balance and elasticity and to minimize stretch marks. Ideal for dry, cracking skin, shea butter has a rich moisturizing component to keep the skin tight yet soft. Verbena has relaxing properties that eliminates exhaustion and stress. It is known for its fresh, calming aroma, with oils that have antiseptic agents. My favourite, Verbena! Bathing has been a sweet escape in the evenings with these as part of my nightly rituals. But I heard that Shea Butter is quite popular especially to the ladies who like to keep their skin soft and supple. As for me, I like to keep skin soft and my sanity intact. 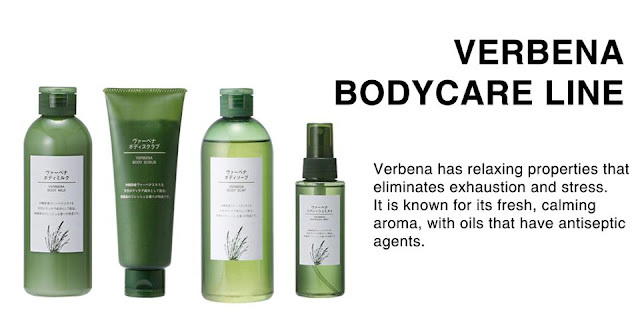 So I choose relaxing Verbana to help me de-stress from all the workload at the office. MUJI has become a cult favourite for many people, present company included, to help them live a simple minimalist life. It’s only lately that I finally set my foot down and go for living a life less complicated. Nope, the Summer heat hasn’t gotten to my head. I just figured that I could use a little simple in my life. Less clutter and more space don’t hurt anyone. J And though it proves to be a challenge for beauty maven like me, glad to know MUJI is there to keep things simple, neat and above quality for me. Make sure you’re Summer-ready with these new MUJI Beauty goodies! This is a sponsored post. All opinions are, of course, 100% my own! Y'all know I think of you first before freebies and moolah!